"The concrete highway was edged with a mat of tangled, broken, dry grass, and the grass heads were heavy with oat beards to catch on a dog's coat, and foxtails to tangle in a horse's fetlocks, and clover burrs to fasten in sheep's wool; sleeping life waiting to be spread and dispersed, every seed armed with an appliance of dispersal, twisting darts and parachutes for the wind, little spears and balls of tiny thorns, and all waiting for animals and for the wind, for a man's trouser cuff or the hem of a woman's skirt, all passive but armed with appliances of activity, still, but each possessed of the anlage of movement." What a poet Steinbeck is! But what does anlage mean? All three will come into play in this story. The Joads and others in Oklahoma don't want to move, don't want to change, but in the Great Depression, dispossessed of their farms, they have no choice. Handbills promising work in California entice thousands to take to the highway, Route 66, and migrate west. Stoic and determined, the Okies (a derogatory term out West), sell all they can, and pile high on old cars what they'll need for the journey and their new life. This much most people know without having read the book. What they may not know is the beauty of Steinbeck's writing, and how drawn into the Joads' lives the reader becomes. Ma Joad is the key to all of it - "from her great and humble position in the family she had taken dignity and a clean calm beauty." She "seemed to realize that if she swayed the family shook, and if she ever deeply wavered or despaired the family would fall, the family will to function would be gone." That realization is sorely tested at times, and its truth shines through in what was, for me, a jaw-dropping ending. Tom Joad the son is a passionate man, and a visionary, who incisively understands one problem after another and how to effectively address it. His integrity is unassailable; the difficulty he faces is keeping himself from losing his temper and striking out at the greedy oppressors and powerdrunk false authorities. His closest traveling companion is the ex-preacher Casey, who once used his exaltatory power to seduce, and now wants only to fully understand humanity and spirit without the trappings of religion. His eulogy for a deceased old man is filled with honesty rather than homilies. "I woudn' pray for an ol' fella that's dead. He's awright. He's got a job to do, but it's all laid out for 'im an' there's on'y one way to do it. . . . if I was to pray, it'd be for folks who that don' know which way to turn." And for all the salmon-like drive west to generate new lives, there are a lot of folks who end up needing that prayer. All of the characters in this story are convincingly drawn, and the depictions of their ordeals vivid. When I grew up I used to read, and hear people ask, Who is going to write the Great American Novel? That came to mind several times during The Grapes of Wrath and I thought, I'm reading it. Steinbeck's Pulitzer Award-winning book tells the heartbreaking story of the Joads, a fictional family of displaced farmers from Oklahoma, forced out of their homes because of years of bad crops in an area ravaged by the dust bowls of the 1930's. The Joads set out on the road in a jalopy packed to the brim with the few belongings they will need while they make their way to California, where there is a promise of plenty of jobs and prosperity. In this social commentary, Steinbeck alternates between the narration of the Joads' progress, and vignettes describing the realities and hardships which directly affected approximately half a million Americans who sought to better their lives of destitution and near-starvation, prompted by advertisements which promised plenty of work picking the ripe harvests in California. The 'Oakies', the term then used to describe these desperate people, were despised by their fellow countrymen because of their extreme poverty and forced vagrancy, but Steinbeck squarely places the blame on big business and the drive for profit at all cost, which was the reason why the farmers were first driven off their lands and then kept in a cycle of poverty they had very little hope of getting out of. The novel received much critical acclaim and was widely read when it was published in 1939, and Steinbeck was later awarded the Novel Prize largely because of it. But not surprisingly, he was also harshly criticized and labeled as a 'Red sympathizer' by those very same people he condemned in the novel. I find it very hard to believe that this novel was first published over 70 years ago as some of the main topics, like unions and labor disputes, are still affecting people today. Steinbeck took real life occurrences and turned them into a masterful novel about survival and strength. Tom Joad and his family have lost their land during the depression and Oklahoma Dustbowl and have decided to migrate to California for work after seeing a handbill advertising the need for fruit pickers. Unfortunately they are not the only family with this idea and the highways are packed with thousands or hundreds of thousands of people trying to find a better life. After heartbreak on the road the family arrives in California and they quickly realize that it won't be as easy as they had thought. With thousands of workers applying for every open position it becomes very hard to find work. When they do find work the wages are well below what they should be because the farmers know that for every worker that wants 30 cents an hour there is a man with a starving family that will work for 20 cents so he can bring home some food that day. This book will pull your heart strings in one paragraph and make you angry in the next. Steinbeck does a great job of taking you on the journey with the Joads and you can feel their pain and their happiness. The joy they feel when they see the California valley or when they find a government camp with working toilets and running hot water. The heartbreak and pain they feel when a member dies or when there is not enough to eat. You can be proud at the strength they hold and how they take care of each other, even in their weakest states. This is a novel that will stay with me for much longer than the time it took to read it. This Great Depression-era novel was virtually unknown to me before this; I knew of its existence, of course, but never even thought of reading it before. There isn’t much of a background of Great Depression suffering in my family; one grandfather had a government job and the other worked as a handyman for his mother, keeping all of her real estate properties fixed up. So, while no one was living high, wide and handsome, certainly nobody was suffering like the Joad family was, either. It is one of those stories where people go from bad to worse and worse still. Somehow the core members of the family kept going on, even though it was hard to see how they were going to make it. A number of characters in the book are rather weak and confused by the way their world has come unglued, but fortunately for them, both Ma Joad and her son, the ex-convict, Tom, are made of sterling stuff and though they never are able to find a really good situation for the family, they keep their heads and manage to move the rest of the family along, keeping them from wallowing fatally and forever in the latest catastrophe to hit the family. 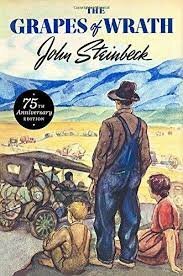 I found Steinbeck most powerful in the chapters that did not deal with the Joad story directly – the ones where he spoke of how things were – chapters that had a clear non-fiction cast to them. It was very easy to see how the Unions came to be; they had to come into being, or else who knows what kind of awful things might have happened – revolution, mass starvation and other things too horrible to think about. The only thing I wonder about is how the Unions have come to be in the sorry condition that they are in the present time. I wonder, as I have for some time, if they will ever recover and after reading this book, I have to think that they have to or else things might slip backward. The end of the book did seem a little disjointed to me – as if Steinbeck did not know exactly how to end it. For me, that last scene with Rose of Sharon and the starving man was of the – “What?! Where the hell did that come from?” variety. But perhaps it has some great ‘significance’ that I missed. However, I suspect that even if it did have some great meaning that I did not get, I still would not have liked it very well. I’m fifty years old, I’ve read literally thousands of books, and I’m not aware that I’ve ever read a novel written by John Steinbeck. Recognizing this deficiency, I ordered a Steinbeck collection, seven of his most celebrated works including The Grapes of Wrath. I vaguely recall seeing the film starring Henry Fonda, and am well aware of the plot and the historical backdrop, but nothing can take the place of reading the work itself. As most know, the book details the westward migration of the Joad family, as they are uprooted from their Oklahoma homestead by the evils of the Great Depression, the Oklahoma dust bowl and the advent of mechanized farming. The family harbors visions of milk and honey awaiting their arrival in California, or so they are assured by the numerous handbills promising plentiful work and bountiful riches. What await them instead are rapacious labor recruiters, unfriendly natives and slow but sure starvation. Steinbeck certainly succeeds in painting a vivid and stark picture of the hopelessness faced by the migrants. His chapters alternate between “big picture” overviews and the particular heartbreaks and hazards faced by the Joads in particular. The story is an education in economics, labor relations, politics and human nature. In this day and age, it is difficult to conceive of children literally starving to death in the shadow of the most productive agricultural land in the country, much of it lying fallow and off limits to those that were capable of growing the food to nourish their own families. I probably could not write a review at this point that will do this book justice, but I would like to touch on a few brief points that tend to bother critics about this book. The Grapes of Wrath is a very much intimate novel that draws you in just as the sentimental novel Uncle Tom's Cabin does. As a matter of fact, while I was reading it, as audacious as it sounds, I felt like Steinbeck was sitting right next to me telling me himself about the issues he was concerned about during the Great Depression. I do believe this is why some people may not appreciate the book as much as I do; not everyone wants to captivated by all of the emotions in the novel, and I get that, but I think that's one of the reasons why this novel was so astounding. In The Grapes of Wrath Steinbeck tells the story of one family, the Joads, who have been evicted from their dry Oklahoma land during the Great Depression and have been forced to choose to migrate to California where there are supposedly jobs for the taking in a veritable land of milk and honey. Steinbeck introduces us to the Joads as they hopefully make ready to travel the width of the country in a cobbled together jalopy with what little money they were able to get from selling off most of their belongings. In dialogue rich with realistic dialect, we come to know Tom, recently paroled from prison for killing a man; his Pa, a man nearly beaten down from his circumstances; Ma, a woman with an iron will who will stop at nothing to keep her family from falling apart; his sister pregnant Rose of Sharon whose husband is full of dreams for their future; and Uncle John who has spent a lifetime trying to face or escape his imagined sin. Through the pages, readers come to an intimate knowledge of the family as they head west helping who they can though they are struggling to make it themselves. It's perhaps because readers come to know and love the family in all its strengths and its failings that makes The Grapes of Wrath a difficult read to swallow. There is absolutely no subtlety nor any particular artfulness to be found in the Joads' story. Never for a moment do readers need to wonder where Steinbeck stands on the events that are taking place. Steinbeck is more than eager to hammer his points home as he preachily derides the corporate farmers whose tractors and hired hands eliminate the connection between men and the land that sustains them. He flays California landowners whose vast fields of hardy crops do nothing for the migrants starving for lack of work. He paints heavy handed pictures of people starving in Hoovervilles even while farmers discard crops to to maintain prices. If, indeed, there is art in Steinbeck's American classic, it lives in the alternating chapters where Steinbeck interrupts his telling of the Joads' journey, to generalize the very much shared experience of the thousands of migrants who fled to California during the Depression. In them, he captures the haggling for a junk car, the staggering number of people heading west fed only on dreams, the growing anger of powerless men, the etiquette of camping, and even the dances that give struggling families a break, however brief, from their sufferings. In these chapters, Steinbeck lets the many voices be heard, he paints pictures with dialogue, and his words even carry the very rhythm of the dance. "The Grapes of Wrath" follows the Joad family, long-time farmers from Oklahoma, forced to leave their beloved patch of earth due to drought and the Great Depression. Banks foreclose on the land, sell it to big businesses who push the families out. Like many other families in the state, the Joads hear of jobs out West, in California -- fields of cotton and orchards of peaches, ripe and waiting for the picking. The family gathers together -- Ma and Pa, Granma and Grampa, Uncle John, Noah, the pregnant Rosasharn and her husband Connie, little Ruthie and Winfield, and the recently-paroled Tom Joad -- and fills a beat up truck with their lives and heads West. Along the way, they battle against hunger, death, and the desert, eventually making it to the Golden State of California, only to find their lives are going to be much worse. The novel provides a fantastic glimpse into what life was like during the Great Depression, especially in California. Those incoming migrants, toting large families while looking for any kind of work, created a fear within the locals -- fear of them organizing, fear of them becoming just like the other Californians. They did whatever they could to keep families like the Joads -- the Okies -- at poverty level. Steinbeck didn't rely simply on the story of the Joads themselves, but interspersed chapters showing what was happening to everyone. They struck me as a Greek chorus of sorts, focusing on the generic while watching those stories play out among the Joads and the people they meet on the way across country. The Grapes of Wrath opens with thick descriptions of the Dust Bowl of America, interwoven metaphors alongside descriptions of the folk attempting to make a living and keep a sense self there, alongside loving descriptions of the very earth itself. It is only after drawing the reader to empathise with the small landowners, with the families, with the Joad family in particular and their way of life and their way of relating to other people, that the slow-burning horror of the situation comes to a head and forces them off their land. It is Steinbeck's notion of pace - not pushing too quickly but allowing the reader to fall in love with the land as though they themselves were the cultivators striving to keep unbroken that chain of succession, that feeling of belonging to the land as it belongs to them, which makes this book a 'classic'. The Joads must flee, escaping hunger and seeking a new place to call a home in sunny California, known to them from glossy magazines showing white painted houses and ripe oranges. As history tells us, that is not what these desperate migrants found. This story is not just about one family, it is about all families who were driven from their land in the Dust Bowl leading to and during the Great Depression. Steinbeck dips into the wider arc of the story, using short chapters dotted between the tale of the Joads to show that their story was indeed the story of all. The Grapes of Wrath is many things, it is a political tract, it is a deep examination of the concept of the American family of that time, it is an explanation of economics, it is a lush description of the Dust Bowl and of California, it is a crushing indictment of the state's response to a humanitarian crisis. Riding high through these messages are those speaking of the power of humanity to push through crisis; of the ability of folk to pull together, the poor helping the poor. A very moving piece of work which is very well structured. The great depression in America is a topic which I didn’t know very much about. The story of the Joad family’s journey across to California to find work is one of survival and determination. Steinbeck captures the desperation and despair of the situation perfectly and I felt really dragged into the hopelessness the characters experienced. It’s extremely difficult to imagine what people went through at this time, but reading this book has made me think about it quite a lot. The main story of the characters is interspersed with more poetic observations on the time by the author. These help break up the story and helped to reiterate that this was a situation which affected more than just one family. I found the manipulation of the desperate migrants by the large corporations to be quite disturbing, a sad reflection upon the human capacity for greed without thinking of the consequences. This is nicely counterbalanced by the generosity of the migrants towards one another, sharing food and helping each other out. Their generosity is even more pronounced as they are living hand to mouth and have little to spare. There are many lessons which can be taken from reading this book and they still apply to the present day. Steinbeck’s The Grapes of Wrath is an intense, harrowing account of one family’s struggle to survive, after being dislocated from their Oklahoma ranch and forced to move to California – land of prosperity- for work. The Joad family and their local (former) preacher, Jim Casey get caught up in the web of agricultural monopolies & Hoovervilles. They bounce from farm to farm, job to job, and camp to camp, as they search for enough work just to feed themselves. The story ends on a note of acceptance and understanding, but without promise or hope. The reality of the Great Depression and the dust bowl devastated “Oakies” seems to settle over the entire novel, the entire country, without so much as a glimmer of better days to come – though the Joads are sure to keep on. Steinbeck’s use of language and scene as emotion is absolutely brilliant. His description makes the moments – and there are many intensely moving moments. He also breaks up the storyline with chapters interspersed that tell almost like a news reel. There will be a chapter, for instance, on the life of a cotton picker, what a man can expect to be paid, how he struggles to feed his family off it, how the pickers are forced to fight over bolls and weigh down their bags with rocks for extra pay; how the scales are tipped in the farmers’ favor and how arguments ensue which are for the benefit of pride, but never truly resolve anything. Then, in the next chapter, Steinbeck brings his reader back to the Joad family and their personal struggle. The reader finds the Joads in the midst of situations described in the former chapter – only this time the impact is more intense, because we know this family – we are rooting for this family, but we already know, we have the facts, that this family is doomed to fail. Still, Steinbeck forces us to cheer them on and to believe, like the Joads believe, that everything will turn in their favor sooner or later. The format – the style and language- make this novel read like a play or a movie, as something almost watched rather than read. Steinbeck’s close, personal relationship with California is also an asset to the tale; he knows these peoples’ destitution and pain; he knows the land and what it does to people, how it promises wealth and easy-living, then turns on those emigrants who have come to reap the land’s riches. Steinbeck touches on this in many of his novels – East of Eden, for instance, but nowhere else is the land such an active character, such an antagonist to the Joads success – and to the success of all the “Reds.” Still, these folks love the land, and will continue to work for just a small space of their own; so we too love the land. Finally, Steinbeck is clearly speaking out in preference of the Union. Casey and Tom Joad – likely the novel’s two most conscientious and laudable protagonists – both, in the end, come to the conclusion to “organize.” They believe it is the only way to get ahead, to get out of the slums and to earn a living for the people and their families. At a time when Unions were being demonized by big and small corporations alike, Steinbeck was courageous –and right- in his championing of them. The only negative I see in The Grapes of Wrath is the lack of resolution. What happens to Connie, for instance, or to Noah? They disappear – walk away from the Joad family and are never heard from again. Are we to believe that they made it, or that they perished? Jim Casy, when he chose to take the fall and was driven away from the Joad family, letter returns as a hero – so, in contrast, we can assume that the two deserters met a less heroic fate? Tom Joad, too, the novel’s main character – in close race with Ma Joad- disappears at the end. We get a sense of where he’s going, but we never know if he succeeds. Finally, the story of the Joads themselves, or at least those Joads whom are left, is also left unresolved. Just when things start looking up for this family – when a little money has come in, when the family is fed and food is not wanted – all luck turns, and everything is washed away. The Joads are flooded out of their camp, lose their truck and their reserves. Rosa Sharon loses even more than this and yet we see her giving care to another in the last moments of the novel, a “mysterious smile” on her face. Steinbeck leaves a lot to the imagination which, in a six hundred page novel, seems unnecessary. My interpretation would be this: the Joads will never make it, but they will never give up trying. This seems to be the reason for Rosa Sharon’s smile – like Mona Lisa’s. Sad, resigned, but alive. A work born of the Great Depression, The Grapes of Wrath is surely one of the greatest, most powerful and important books in American literature. Focussing on a poor family of tenant farmers escaping the Dust Bowl of Oklahoma, Steinbeck set out with the express intention of shaming the people he held responsible for the plight of these losers of the Depression, and aimed quite simply to "rip a reader's nerves to rags" with his tale. The Joad family sets out for California with their few remaining possessions, seeking work, land and new lives among the colourful orchards and vineyards of the western state, a veritable promised land. Instead they find further hardship, exploitation and abuse, labelled as 'Okies' and reds, welcome if they're willing to work for a pittance, hounded should they try to make a living for themselves. Very reminiscent of Upton Sinclair's The Jungle, it's easy to understand why the book was rewarded with so many accolades, and its author with the Nobel Prize for Literature. What sets the book apart from Sinclair's style is the directness of Steinbeck's writing. The family is full of quirky and unique characters, entirely believable, if slightly monochrome in flavour. Other readers have complained the book is divided rather obliquely into the 'good' and the 'bad', and whilst they make a reasonable point, this neither detracts from the overall message of the novel, nor prevents those characters from acting as the real driving force of the story. The heroes of the novel are true salt of the earth, which gives the book openness and accessibility: that Steinbeck writes their dialogue in their vernacular is a powerful motif. Steinbeck intersperses his tale of the Joads with rather more artistic and morally or politically charged chapters covering the broader sweep of change facing America in the 1930s. In effect, the chapters intertwine the individual experiences of the Joad family with the macrocosmic overview of society in the Depression years. Steinbeck's rather more loaded and overt statements appear in these segments, but he also allows his characters to speak for him, especially Tom Joad and the preacher. I officially habve a NEW favorite book. Not because I love a happy ending or fanfare, but because I love to EXPERIENCE what I'm reading through the authors' words. Our TV's today may be 3-D, but this book was a 4, maybe even 5, -D experience. It is so well-written I shivvered with cold as they sloshed through water, drenched and hungry; and my heart warmed with tales of home and dreams of what could be. This book opened my eyes to a side of the industrial revolution that I'd never before seen; and terrorized me with the realization that it doesn't take much for neighbor to turn on neighbor, given the right circumstances. This book was the kind of book that taught me how to be a better person, and forced me to apprecite the "Fambly," food, and roof over my head I so often take for granted. I'm a better person after reading this book. Let's face it: The Grapes of Wrath is something of a slog. That's because it's a political novel, with a very clear agenda, rather than a great story like East of Eden, for instance. You know from the start that the Joads, the Okie family that migrates to California after being pushed off their land by the factory farm corporations, are only going to meet up with misfortune and tragedy. And the chapters that alternate with the Joads' story, which abstract their situation to the hundreds of thousands of people who were victims during the Great Depression, aren't easy reading by any means. Those, plus the country dialect, slow things down, which is why it took me 3 months or so to get through this book, alternating with other things when it just got too depressing. Reading this may be a slog, but it's a necessary slog, in my opinion. That's because John Steinbeck has a lot of important things to say, and he says them quite well. Those things that he has to say -- about poverty, corporatization, becoming separated from the land, and the utter lack of morality that exists in our capitalist system -- those things are, sad to say, just as relevant today as they were during the Great Depression. There are lines in this book that made me gasp with the truth of them, or wince as my heart broke to read them. Children starving while perfectly good food is destroyed in their sight because the food can't be sold for enough profit. Workers manipulated to take lower wages than they can support their families on and then turned out homeless when no longer needed, treated with less care than pack mules. Today, in this rich country, children are still starving. We have come a long way, that's certain, but not far enough, especially when we seem besieged by political and corporate powers that would like to turn the clock back to this terrible time. I fully recognize that what I say about this great novel won’t amount to a hill of beans compared with the many erudite, perceptive, and occasionally dull things that have already been said about it. But I feel that if I don’t say something, I will be a criminal haunted by his own silence and laziness. The Grapes of Wrath is such an important book that I feel I must, at the very least, tell people who haven’t read it that they simply can’t afford to put it off any longer. The perspective gained will help them understand the corporate arrogance and corrupt politics that create and profit by the world’s problems, as well as the harsh and increasingly violent economic reality faced by growing numbers in the United States and abroad. The Grapes of Wrath is a history lesson, a call for justice, and a literary achievement all in one. It is an eloquent poem of the downtrodden, who are unable to speak for themselves. It is an epic journey filled with hardship, sorrow, and strife miraculously illuminated by human decency, kindness, and hope. It is also a warning against complacency, and a reminder that quite often what is assumed to be a right has been built upon the misfortune of others and the cruelties they have endured. Steinbeck accomplishes all of this by telling the story of the Joad family of Oklahoma, tenant farmers compelled to leave their Dust Bowl home by economic forces too great for them to resist. In so doing, they become part of a westward migration made up of thousands of uprooted families lured by the promise of agricultural work in bountiful California. To their horror, they are met with hatred and mistrust, and soon discover that work is nearly impossible to find, and that when it is found, it doesn’t last and isn’t enough to live on. And so the Joads find themselves faced with a great paradox: that of starving in a land of plenty. Caught up in the battle between Labor, Big Money, and increasing mechanization, the Joads and other migrant families are used as strike-breakers one day, only to have their meager wages cut in half the next. As soon as a given crop is harvested, they are kicked out of their subhuman accommodations and told to move on under threat of violence. Roadside camps are burned; scapegoats are picked at random and labeled as communist troublemakers. The hungry migrants are seen not as fellow Americans down on their luck, but as a filthy, inferior race that threatens to infect the native population. This novel is a classic example of a personal story set against a giant backdrop of events. As such, it is impossible to read it without putting oneself in the time and place of Ma Joad, as she clings to her pride while giving strength and encouragement to her family as it grows angry and resentful with hunger and threatens to unravel, or her son, Tom, who is so outraged by the way his people are treated that he decides he must somehow learn to champion their cause. Thanks to Steinbeck’s realistic presentation, after spending some time with the Joads, the reader sees the food on his plate — if he is lucky enough to have food at all — in a completely different light. A great part of Steinbeck’s success comes from his use of everyday language and dialect. The story isn’t told in a detached or elevated manner, but in an earthy way that is a natural outcome of the subject matter. Some reviewers at the time thought the use of dialect was foolish or contrived — the same criticism once leveled at Mark Twain. Having heard the dialect as a kid in Central California myself, it is my feeling that Steinbeck would have killed his book by sanitizing it. Through talk, he established a sense of immediacy and familiarity. The Joads were real people, and their predicament was as real as the Depression era that spawned it. Also not to be overlooked is the book’s humor. This is something else Steinbeck understood: the roots of laughter are nourished by hardship and sorrow; humor, like song and dance, is an expression of pride and survival. Steinbeck wrote some good novels, some that are even almost great (East of Eden comes to mind); this, however, is not one of them. The Grapes of Wrath is little more than bad communist propaganda. It isn't that the kinds of things he describes didn't happen, but the way he presents them---without looking for the deeper cause (rather than pulling out the tired old scarecrow of "greed", an abused and vague term anyway) or offering a real solution but rather simply pushing for a (dubious at best) political program---is not only unrealistic, it isn't artistic either. About the only time it approaches the level of genuine literary expression is when Casy goes on about how his idea of holy is for every man to be shackled, not even to every other man, but to Mankind as a whole. That's a horrible thought, but at least it's a somewhat deeper one. Even Tom Joad's famous "Whenever you seen a cop beatin' a guy..." speech is all about the insignificance of the individual, and as if to prove his point, Steinbeck continues the story for quite a while after that but Tom (despite having been the main character up to that point) does not reappear. And stylistically, this is one of Steinbeck's worst...it could be described as faux-Hemingway---lots of awkward sentences, unnecessary repetitions of words rather than using pronouns, etc. But it actually reads more like Socialist realism than anything else. It has a lot in common with some stuff put out by the Union of Soviet Writers under Stalin around that time. East of Eden is much better written, though Steinbeck is still using some techniques he seems to have learned from writers like Kataev. I did a bit of research after finishing this, and it looks like Steinbeck actually joined and had further involvement with the League of American Writers, which was set up by the Communist Party USA in 1935 in sympathy with the Union of Soviet Writers putting its policy of controlling and censoring the output of authors into effect the year before. Anyway, enough was known here about what was going on under the Soviet system by the time he wrote The Grapes of Wrath that he couldn't have had any honest excuse for glorifying it like that. It took me two attempts to get past the first 20 pages of the book. But when I did get past and finished the book, I knew that I had read just about the best book ever written. After I'd decided to reread this classic of 20th Century American literature, I was amazed to realize I'd never read it before. My crystal clear memories of it were actually memories of the movie, not the book. How I ever managed to get an MA in American lit w/o reading this perplexes me, but I'm glad I made the effort to read the book. This is John Steinbeck at his best. The scenery is captivating, as are the characters. One really gets a feeling for how beaten down the tens of thousands of ousted sharecroppers and dustbowl farmers were who fled with all their belonging to the promised land of California. And how brutalized they felt when they weren't welcomed with open arms. The glut of laborers overwhelmed the job market, driving wages down to below the survival level. And landowners, frightened that the mobs of impoverished Okies might turn violent, often burned their settlement camps to force them to move on. This is a bleak book. The characters keep getting knocked down by one setback after another. But they keep on getting back up and pushing forward. I highly recommend the audio book version of this narrated by Dylan Baker. It just makes it a lot better to have the accents clearly as opposed to whatever your brain does to Steinbeck's transcriptions.